When I think about who he is, that's the first thing I think of -- a sort of unsettled, straining, and restless energy that was the quality of his soul. My Dad was a little bit crazy and very much alive. That restless energy made some people uncomfortable. My Dad was not good in polite company. He headed straight in conversation for the most taboo topics. He could size up a complete stranger in an instant and would center in on what made them uncomfortable and unsettled. This sounds mean and aggressive when I write it, and I think that he came off that way to some people. But what he was doing was inviting people into the way that he lived in the world, which was open and unsettled and vulnerable and chaotic. He wanted to dispense with the guards we put around us and meet on terrain that was more open. He felt most comfortable there. Although my Dad loved to provoke people he was never calculating -- it was instinctual. He never controlled fully the energy that coursed through him. The closest he came was as a young man, a state champion pole vaulter who also loved to party and dance. He couldn't control the energy but as a young athlete, he could vibrate with its frequencies. The purity of my Dad's energy is something that those closer to him knew. Once you got past his provocations, a different man emerged. My father was almost totally selfless. Perhaps because he could never build a self around all of that instinct and spirit, he just never demanded much from anyone. He was also deeply sensitive and capable of deep emotion. Though he never said it much, I knew how much he loved me and my brother, along with his mother and his own father and his brother and sister. His life centered on a small circle of people who he would do anything for, without complaint and without judgment. My Dad died suddenly and it appears he left without suffering, at least in that moment. In the later years of his life, my Dad suffered quite a bit. His body rebelled at the energy of his spirit, tightening and tensing up on itself. Sometimes the energy was too much for him to bear, and his way to deal with it wasn’t always healthy. But he took it all on himself and didn't want to bother anyone with it. 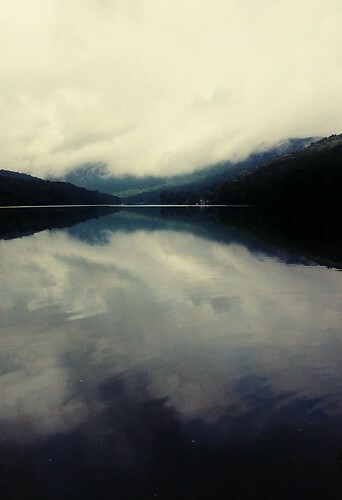 The memory that flashes before me now is of me and him fishing on Santeelah Lake up in the North Carolina mountains. It was sunset, the lake reflecting brown and orange sky. All of a sudden, the smallmouth started biting, and it was total chaos. I was probably 10 years old, and my Dad and I reeled them in, one after another, these tight wriggling fish pulled like electricity out of those clear cold waters. That's when my Dad was at peace, with his son, in nature, with forces as wild and clean and wriggling as that soul-stuff that ran through him. That night is 25 years gone and now so is my Dad, gone with it, but he was never here to stay anyways. He was unsettled and vibrant and now he is gone. I'm sorry for your loss, Jeff. That's a nicely written tribute to your Dad. Oh my god jeff. How lucky he was to be known so well. This is beautiful. My condolences. What a beautiful account of an apparently beautiful life. I'm sorry for your loss. This is as good a tribute to a father as I have ever read. Peace to you. Thinking of you, Jeff. What a wonderful piece about your dad. Beautiful, sad, honest. Thanks, Jeff. I love you used the word vulnerable. That's one of my fondest memories of him - playing bridge with you, me and Andy, completely absorbed in the game and repeating, "He's vulnerable. He's vulnerable." He played bridge like he lived. That's a beautiful tribute to your father. I never met him, - I don't think - but after reading this I wish I had had the opportunity. It makes me wonder how he would have "sized" me up:) I'm very sorry for your loss. Jeffrey, what an accurate tribute. I loved his spirit, humor and intelligence. Sometimes it was difficult, but I loved him so much. He was always there when I needed him and we had an undescribable bond. We were alike, that way. I feel honored to have been loved by him and grateful, I met his family. For sure -- share away. Jeff, He always told me what you were doing. he was so proud of how ya'll had turned out. He was a great competitor who hated to lose at anything. Fishing, racquetball, ping pong, it did not matter. You described him well. Jeff, I am so sorry for your loss. I enjoyed reading this. Thank you. Wonderful tribute, Jeff. You have my sympathy. You had a great father and he gave you great memories, cherish those forever. I'm trying my best to provide the same for my kids with needs, wants, trips, homeschooling and love. I recently read a friend's blog about his parents and unfortunate situations. So, anyone can be a parent but good parents are what is needed ever. It appears that he set you up for success that will carry on for generations, congrats. It is said that “his best day on earth is our worst”; as we mourn the loss - he is in a better place. i think your dad would probably have scared me somewhat, but that being said, i'm so thankful you shared this. it's just lovely, and it demonstrates love so clearly, even through our admittedly inadequate words.